Detailed plans to transform Kidderminster railway station into a landmark gateway to Worcestershire are revealed today (Thursday July 6). The station is to undergo a dramatic redevelopment, including a new glass-fronted station twice the size of the existing building. Facilities will include a new café or shop, toilets and indoor seating and waiting areas. 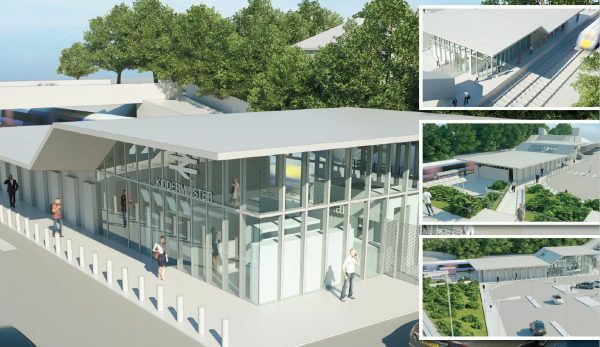 The proposals will be on display at an information session on the forecourt at the station on Wednesday July 12, from 7am – 6.30pm, when train users, nearby residents and businesses will be invited to comment and view artist impressions of the scheme. The station, which has direct trains to the heart of London, Birmingham and Worcester, was used by 1.6 million people last year, with numbers predicted to rise 50% within five years. Clearly marked waiting and taxi areas will be created in front of the station to make it safer for pedestrians. The scheme also proposes significant improvements to nearby bus facilities and a new pedestrian crossing close to the station on Comberton Hill. Ken Pollock, Worcestershire County Council’s Cabinet member for Economy and Infrastructure, said: “We have listened to the concerns of travellers about the inadequate facilities at Kidderminster. “It is the second busiest train station in the county and is a major gateway into Wyre Forest and beyond. The scheme is being led by Worcestershire County Council with support from Wyre Forest District Council, SLC Rail, Network Rail, London Midland, Chiltern Railways, the Severn Valley Railway, Kidderminster Railway Museum and local bus operators. Funding has been made available from growth deals in place with the Greater Birmingham and Solihull Local Enterprise Partnership (GBSLEP) to the value of £1.8 million and through the Worcestershire Local Enterprise Partnership to the value of £2.5 million – a total available investment of £4.3 million. Gary Woodman, Chief Executive of Worcestershire Local Enterprise Partnership, said: “It is great to see that plans for the transformation of Kidderminster Railway Station have now been revealed. Mike Lyons, GBSLEP Board Director said: “We are delighted that the Kidderminster Railway Station transformation plans have been unveiled. “This is an excellent example of how neighbouring LEPs can work together successfully to support shared priorities for both their businesses and residents. “Kidderminster is an important part of our economy, and this is a high priority project for GBSLEP. Tenders will be invited from contractors with a view to project completion by summer 2019. Pictured: Worcestershire LEP is investing £2.5m in the redevelopment of Kidderminster’s Station.